I’ve certainly enjoyed great teas this year (The Royal Horseguards Hotel and last week’s Science Tea at the Ampersand Hotel), but as someone who can never pile enough cream on her scones, I’m always up for a new location. Do you remember my recent post on St Martin’s Courtyard in Covent Garden? It’s one of my hottest new discoveries for inner sunshine in London. Recently, I had the opportunity to enjoy tea at Bill’s, while I met with Rebecca from Sister PR to learn more about this great area. And here’s the first reason I love Bill’s Afternoon Tea… I was able to order their Hedgerow Fizz (a Prosecco and elderflower cocktail) in place of a pot of tea. You know I love my bubbly, Sunny friends! While I sipped on the juice in my flute and waited for sandwiches and sweets, I understood why there was a raspberry floating in my fizz. Bill’s simply does not hold back on colourful images anywhere! It’s just loaded with sunshine and warmth! After a very short wait, our three tiered feast arrived, and it was absolutely scrumptious. The sandwiches are: cucumber and cream cheese, salmon and cream cheese, egg and cress and ham, tomato and mustard. The pastries are fruit flapjack, lemon meringue tart, chocolate fudge cake and strawberry cream tart. And the final tier features fruit scones with cream and jam. Rebecca and I were careful to split each selection so we both could share and enjoy the wonderful flavors. And, we finished every bite! I definitely felt many rays of sun during this afternoon tea! Cheers to Rebecca and Sister PR for the complimentary tea. If you’re looking for a casual, non-fussy tea that won’t destroy your budget, Bill’s Restaurant Covent Garden is a beautiful spot to enjoy. 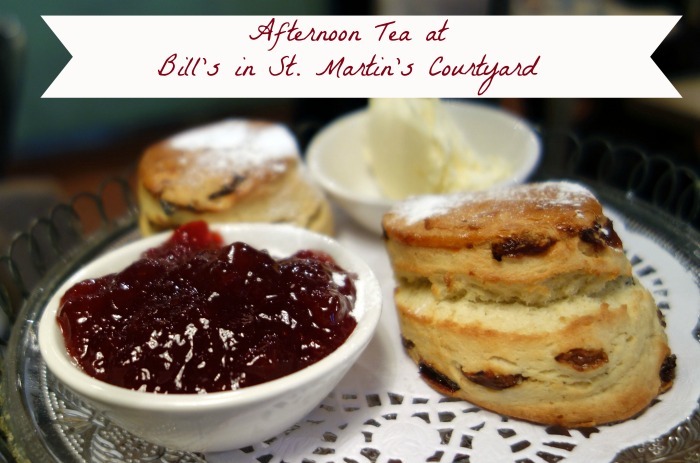 The Afternoon Tea is £9.95 per person and Sparkling Afternoon Tea is £12.95. It’s available from 2:30-5:30 every afternoon, for a minimum of two people. I’d also suggest visiting their website to check out their fabulous breakfast, lunch and dinner menu as well. They have 16 locations in London and numerous others throughout England, including St Albans. Have you been to Bill’s yet? What other suggestions do you have for a casual afternoon tea in London? They started doing Afternoon Teas a few months before I left London but I never got round to doing one. Unfortunately even though Bills are beginning to pop up round the country now we don’t have one up in Newcastle yet, although I did e-mail them to ask and they said they’re looking at available spaces up here at the moment .. OH YES! So thanks for sharing, I’ve been very curious to see what they offer, being a bit of an afternoon tea fan. It looks great, and such an amazing price too! I’m packing my bags, save me spot at the table. This looks amazing! PS I love armchair traveling with you! I’ve heard alot of good things about Bill’s and your post has inspired to visit! I love the look of the place; like a little general store or something. I’m not a massive fan of sweet things but give me a smoked salmon sandwich and a glass of champagne and I’m in heaven!! I have never heard of Bill’s before but after reading this will have to pay a visit! I may have to turn in my coffee mug for a delicate cup of tea! The idea of taking time in the late afternoon for such a lovely array of goodies sounds wonderful. AND, a little bubbly now and then isn’t too bad either!!! A noon PB&J lunch now seems so boring. I didn’t know Bill’s had a tea. I wonder if the one in our town does. I’ll have to check into it. I’ve not been. Their restaurants are absolutely lovely and rustic! I just haven’t seen anything on the menu that just draws me in! I guess I need to give it another go. And I like the sound of the price!